One of the top 10 great Guru monks of the country is Luang Phor Chong of Wat NaTangNok Temple, BangSai district, Ayuthaya province. 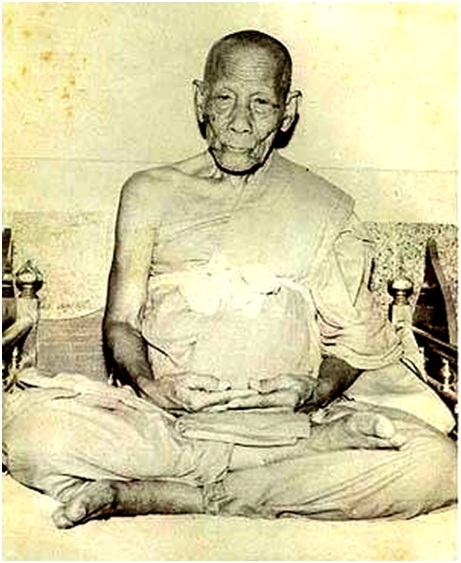 He passed away on the Buddhist important MaKhaBuCha day of February 17th, B.E.2508, with the age of 93. Luang Phor Chong and Luang Phor Parn of Wat BangNomKho are close friends and respected high Dhamma practices of each other. They had the same teachers viz LP Soon of Wat BangPlaMoh and LP Paan of Wat PikulSokant. Even Luang Phor Parn reached extremely high miraculous knowledges of "Apinya" and "Wipassana", he still often admired Luang Phor Chong as a good great monk. Once in the evening Luang Phor Chong was taking a rest at the pier in front of his temple, a small group of men rowed across the canal. After tying a boat robe to a pier hook, one said unrespectably to Luang Phor Chong,"Luang Phor, would you guard my boat because I was told that so many thiefs around here." The old Luang Phor Chong said slowly and mercifully to that man," Alright, I'll guard your boat as mine...don't worry." The group of men came back to the pier at around midnight, they saw Luang Phor Chong still sat alone at the pier. "Wow, how great it is, you're still sitting here so many hours, I thank you for guarding my boat," said a man. "You ordered me to guard your boat, I completely did it," Luang Phor Chong said slowly to the man. But at the evening of the next day, the men came to Luang Phor Chong's Kuti(monk's house) with flowers, incenses and candles on their hands. They had paid obeisance to Luang Phor Chong and said " I come here to apologize you for ordering to guard my boat, I have been told that the you are Luang Phor Chong, so please apologize all of us for doing a great sin, please grant us your apology." " Huh,huh...alright man...you ordered me and I did it for you ...it's no sin .....from now on remind yourself do not order any monk as your servant," said Luang Phor Chong. He also taught them a short brief of Buddha's Dhamma. All the men listened quietly and wept, then they pay obeisance with full respect to Luang Phor Chong's legs. Luang Phor Chong was a great donor. Any temple troubled with lacking of Kutis, he would order his monk disciples dismantle them and brought to the lacking temple. Even thiefs came into his temple to steal some thing that's difficult to get, Luang Phor Chong knew that and called them to get it.Yes, he gave stuffs to thiefs but never forgot to taught them that stealing monk's stuffs was a great sin. Many thiefs gave up stealing by his teachings. Luang Phor Parn of Wat BangNomKho admired Luang Phor Chong to all his disciples that he was like a gold monk statue, and that a monk of this kind one should never beg anything from him because he would give everything that was begged for. Whenever Laung Phor Parn performed any religious ritual at his temple, he would invite Luang Phor Chong to join. Once Luang Phor Parn urged his close monk disciple to go by a motor boat to invite Luang Phor Chong to join a ritual , but Luang Phor Chong told the monk to go back in advance and he would go by himself later. As soon as the monk had come back and reported to Luang Phor Parn that Luang Phor Chong would come later, Luang Phor Parn laughed mildly and pointed to Luang Phor Chong who was sitting right there!! How did he come with a short time? It's many miles distance between the two temples, if going by walking it would take a few hours. 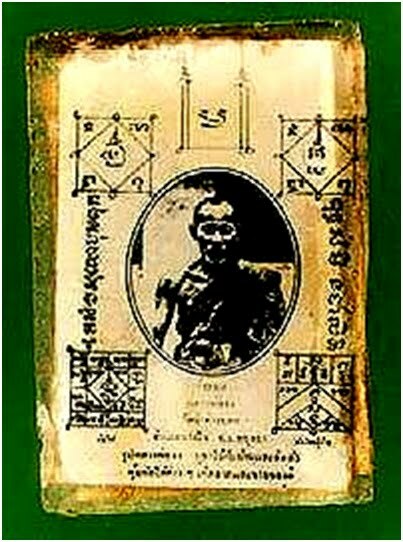 It was recorded that Luang Phor Chong reached the highest knowledge of "PatiSamPhiThaYan" which covered highest ability to perform miracle of all kinds. Whoever reaches this state will have comprehensive knowledges over all Tri Pitaka automatically and could rush to anywhere in a short time. 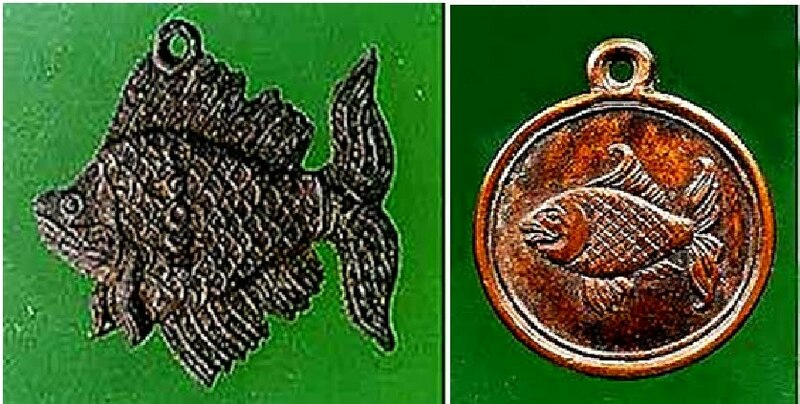 Luang Phor Chong created many kinds of amulets since the WW II, such as medals, small statues, ivory-tusk Rajasihas, metal Ta Pian fish , sacred jackets, etc. His amulets are very good for warding off dangers of all kinds, while his Ta Pian fish is good for fortune fetching. 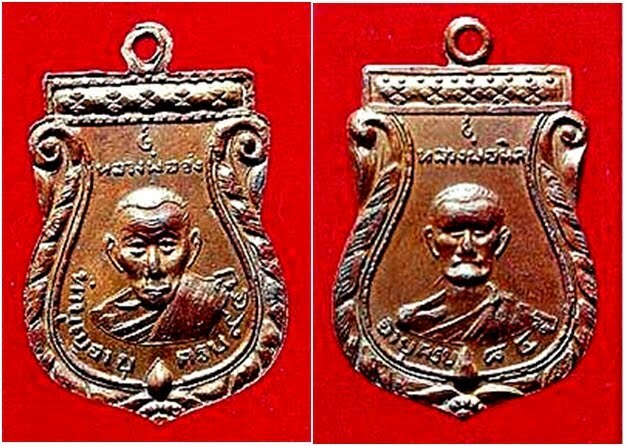 Copper medal of Luang Phor Chong (left) and Luang Phor Nil ( Luang Phor Chong's younger brother. 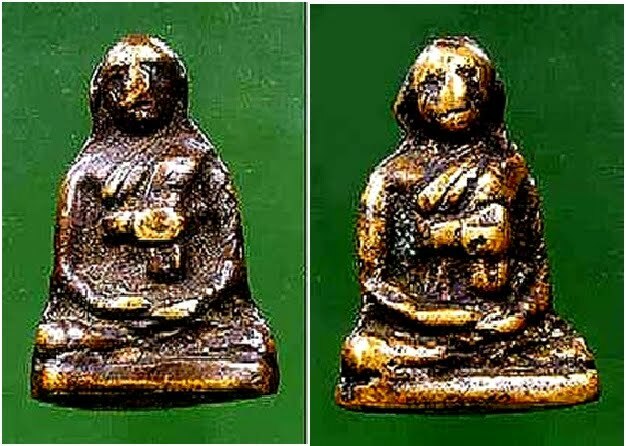 Small bronze figurine of Luang Phor Chong .